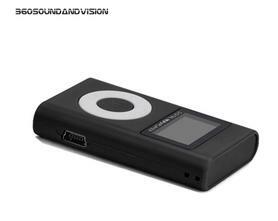 The 360 Beats 100 Pocket MP3 Player takes Micro SD Cards, has volume control, a Mini USB Output and comes With Over 100 Beats From The 360 Sound And Vision Sacred Instrumental Rap Library. Comes with a built-in Rechargeable Lithium Battery, 360 Sound And Vision BEATS 100 Micro SD Card, Micro SD Card Adapter, USB/Charging Cable & the 360 Sound And Vision PH 101 Basic Stereo Earbud Headphones. Limited Edition of 200 units will be produced, hand engraved and numbered.Comes in original 360 Sound And vision packaging.